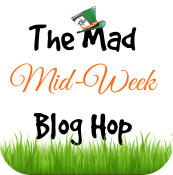 Warning: May contain spoilers though I’ll try my hardest not to! To provide you with a brief history – I’ll be honest with you from the start; put my hand up in the air and admit that….. I have actually NEVER read a Harry Potter book! 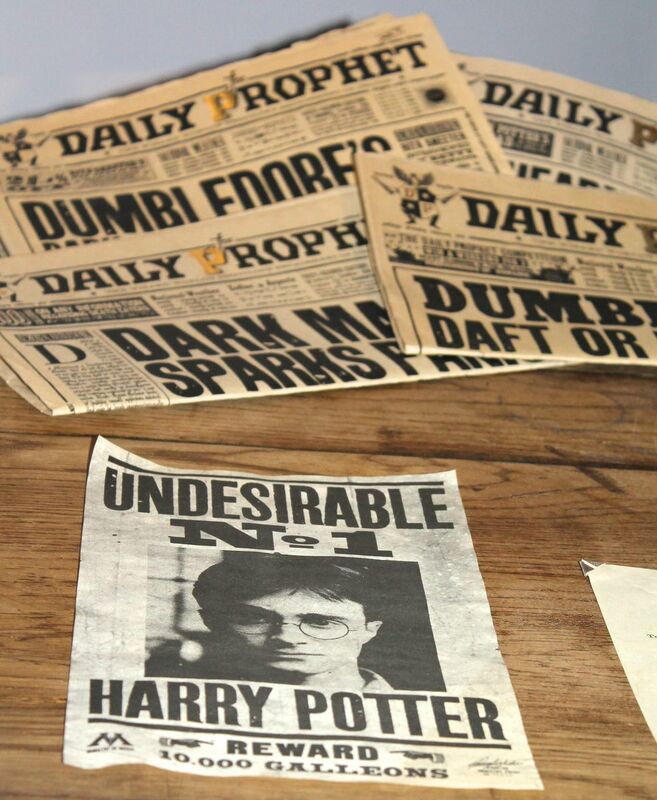 I remember the anticipation when JK Rowling alongside her publishers, Bloomsbury Publishing announced the launch dates of that very first book; and the sheer thrill and delight of children everywhere when it first went on sale back in 1997. I remember working in Turkey (with my now husband) as he ran eagerly to the reception of our water sports center hotel to collect his mail delivery from the UK. It was that very book. Harry Potter and the Philosophers Stone. I remember as people gathered around him, one by one asking if they could be the next to read the book once he’d finished it. Which he did in double quick time! So from this – I was never really party to what all the hype was about each time a new book was released. Then along came the films. And from the moment I exited the cinema, I was hooked. I was a Harry Potter fan! My Dad has always been a huge admirer too. He’s read all the books and seen all the films – which for him is quite something, as most things he just regards as trash! 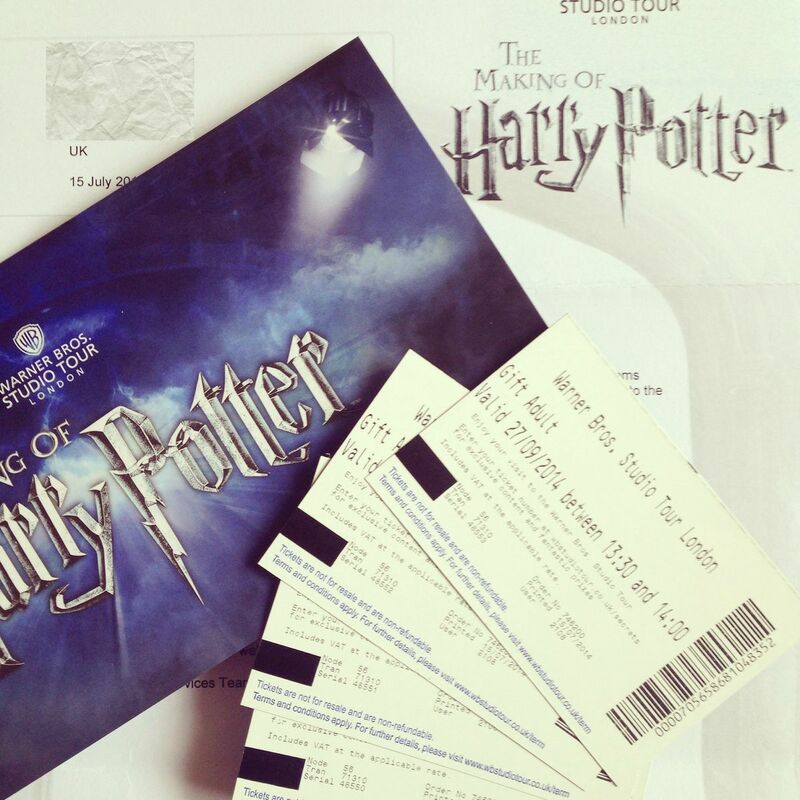 So, last Christmas I racked my brain for ideas of a good present to buy for him, other than the standard pair of socks and a chocolate bar, when it hit me……..
……..Tickets to the Harry Potter Studio Tour. And obviously it wouldn’t be very nice for him to take a day trip on his own – so naturally I bought tickets for my mum, Mr B and I as well!! So off we trundled via the M25, over to the Leavesden filming studios in Watford to join Harry Potter and friends at the Hogwarts School of Witchcraft and Wizardry. We pulled into the car park and looked on in awe at the huge Harry Potter sign with vast photographs of the cast members lining the outer studio wall. We were all so excited and eager to get in! 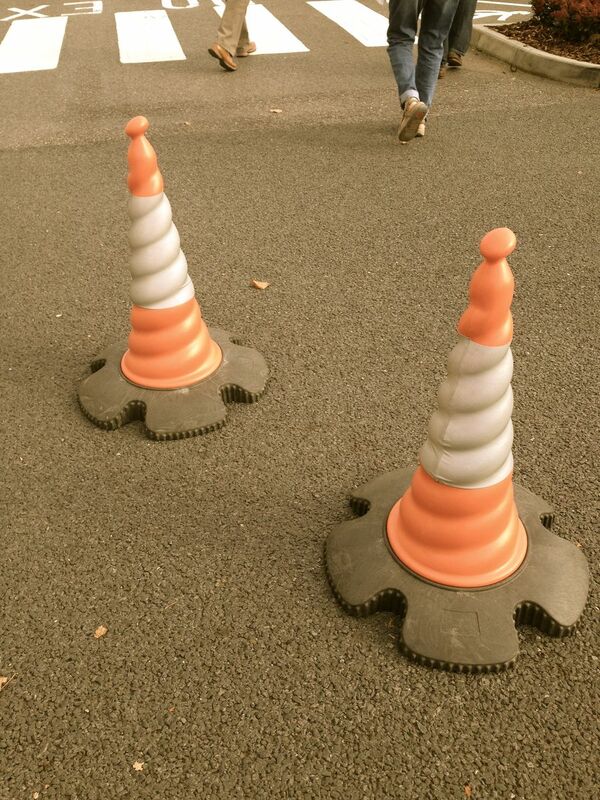 Photo – even the parking bollards are sorting hats!! Entrance to the tour is all pre-ordered and booked online prior to your visit, so there was no need to head to a kiosk and queue for ages to get your tickets. 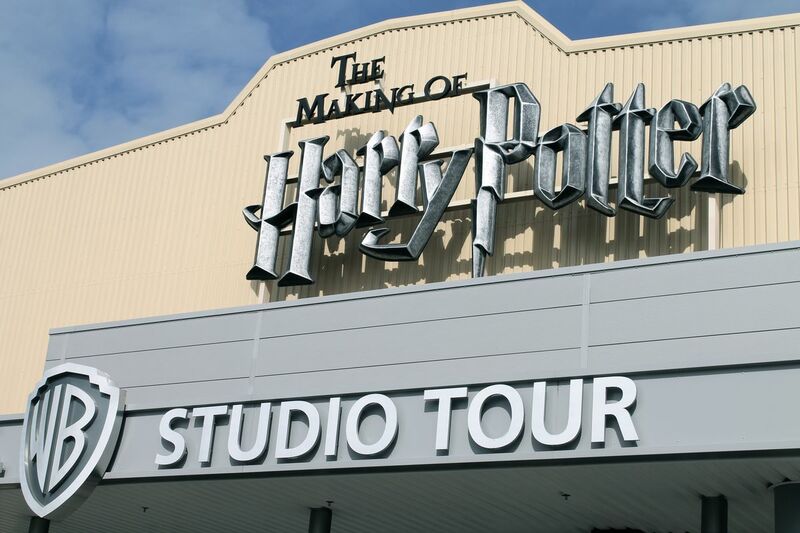 Allocated time slots of 30 minutes (with a maximum number of tickets sold per allocation) ensure an expedient flow of human traffic throughout the tour, which worked extremely well considering the amount of people catered for at the studios in any one day. We certainly never felt it was overly busy or crowded. We took our place quietly in the queue, as any good Muggle would, and waited. After an initial ‘hello and welcome’ in the first of two rooms,from one of the many friendly and very helpful tour guides, we were ushered into a larger screening room, much the same as a cinema. 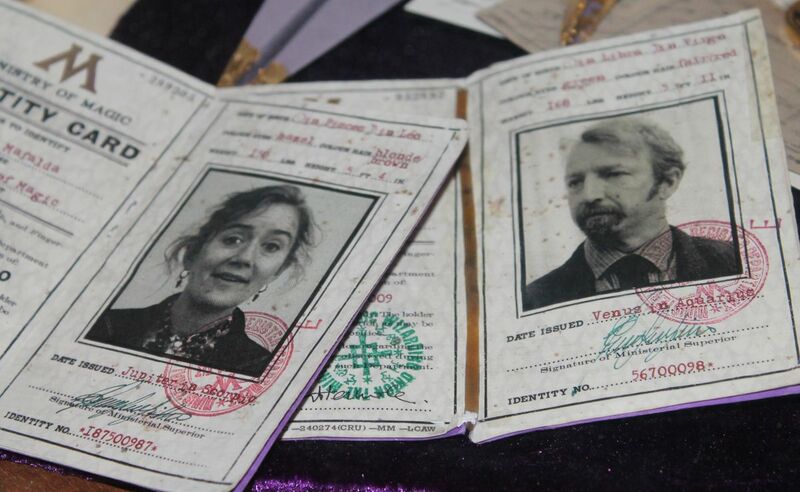 After a second hello with further introductions, the lights dimmed and Harry, Ron and Hermione welcomed us from the screen itself, taking us on a small journey back through time through each of the eight popular and hugely successful films. We all bustled hurriedly to the front of the auditorium in order to get through the main entrance door. All around us were gasps of delight, and shrieks of wonderment as we were suddenly transported from reality into a and magical world of fantasy and adventure that we’d only ever seen on screen. It was all very surreal. 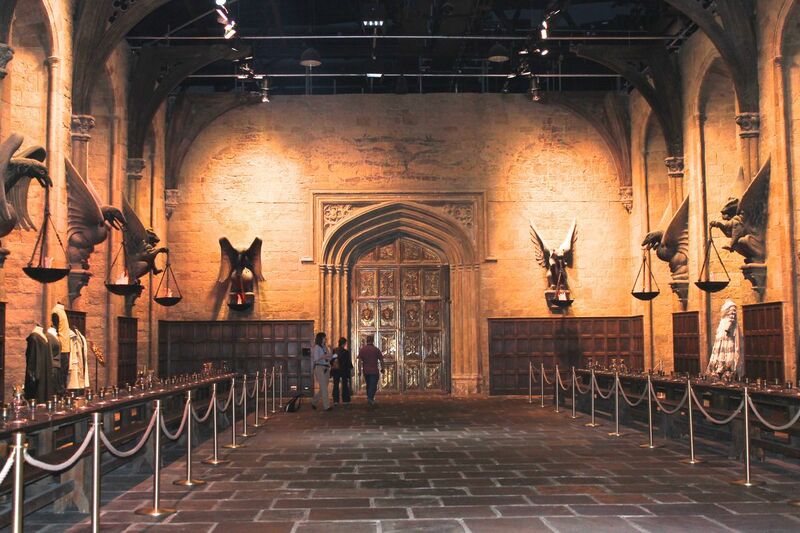 I had walked through and was standing in The Great hall!! Where they’d actually filmed the scenes!! Where Daniel Radcliffe, Rupert Grint and Emma Watson had read and rehearsed their lines. From the hall – it’s onwards into the sets and special effects area, where many of the famous interior sets are still housed and preserved in their astonishing entirety. 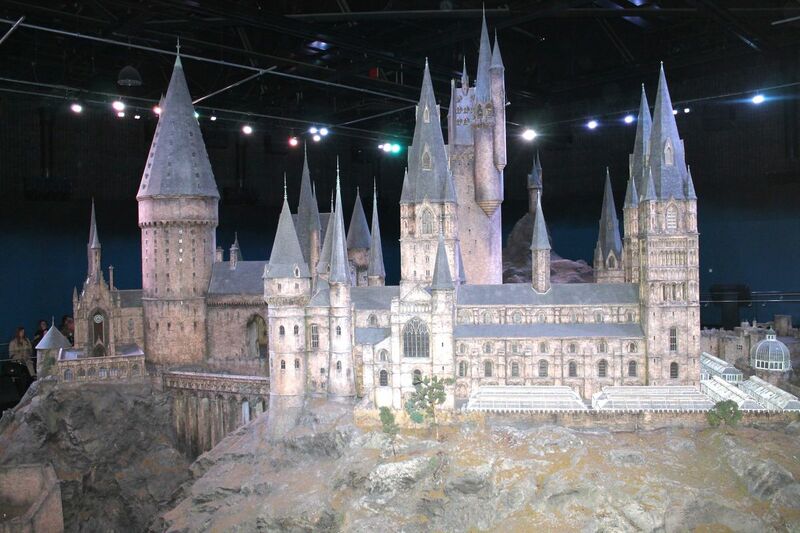 Such sets included the Weasley’s kitchen, The Gryffindor Boys Dormitory, Hagrid’s Hut, The Gryffindor Common Room and The Ministry of Magic to name but a few. Short films and videos are also displayed, providing a glimpse into the secret special effects that go into making the films so enchanting and realistic. 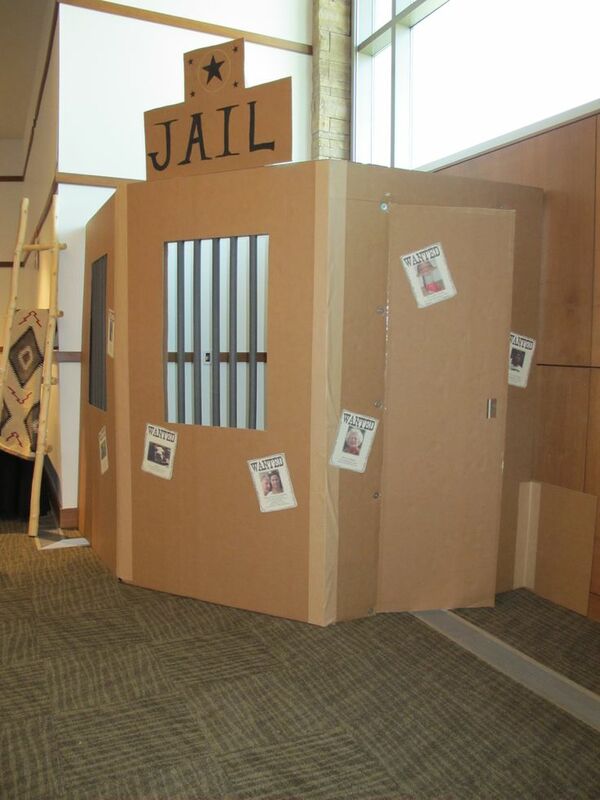 In here you can also try your hand at flying on a broomstick, and star in your very own mini motion picture in the Green Screen rooms or how about a live lesson on how to handle a wand correctly. As you walk through looking at each exhibit you are transported back into each film. There is so much to learn and appreciate that you almost need the whole day to absorb it all. From the interiors room, you enter the Backlot. Basically, home to the exterior sets which are outside in the open air. Here you could take a seat in the Weasley’s Ford Anglia or walk through the hickaldy-pickaldy Hogwarts Bridge. This was also where you could grab a quick bite to eat from the refreshments stall and maybe even treat yourself to a butter beer or two! 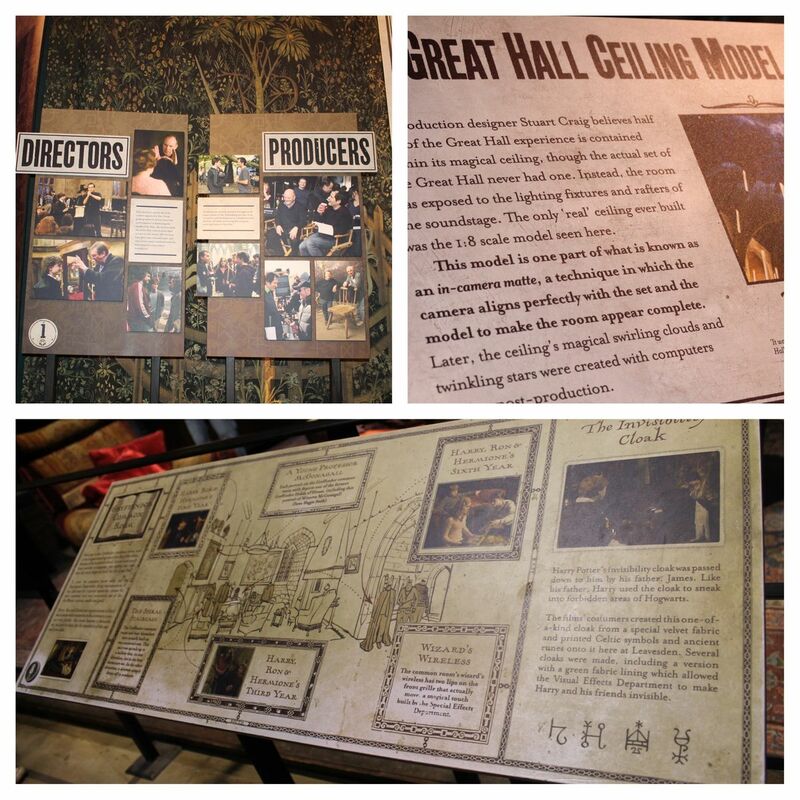 Numerous props and sets, from the small to the very large, are on display with videos describing the workings and processes behind each one, which really gives a fabulous insight as to what actually went on behind the scenes. Here you will learn about the creature effects. You come face to face with the terrifying Aragog and the rather lovely Buckbeak; and recognize many, many other memorable characters along the way as you walk towards the final sets of the tour. 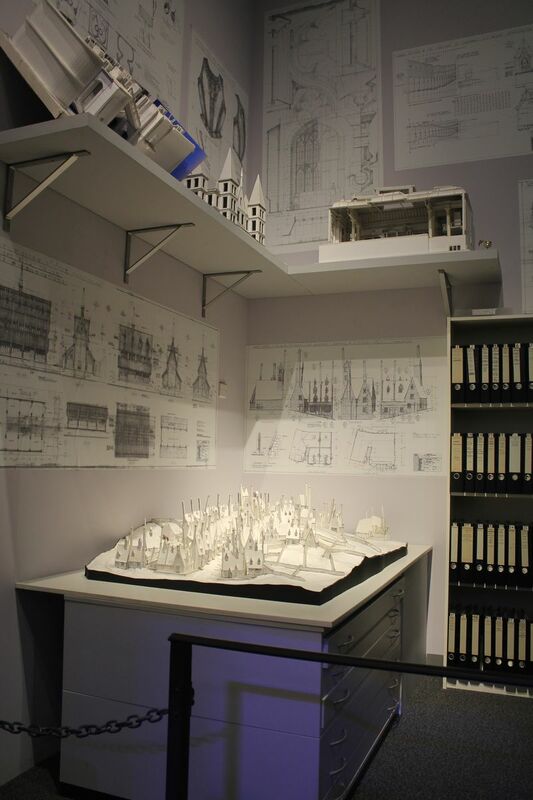 The final one being the enormous scale model of Hogwarts School itself. A truly jaw dropping moment! Throughout the tour it becomes wholly apparent that the attention to detail, the level of intricacy and the sheer extent of the dedicated time and effort of both cast and crew is astounding. I absolutely believe that you really don’t have to be a potter fan to enjoy the tour. Instead you can visit, be intrigued and appreciate such work and be in awe of the journey taken from the initial penning to paper by JK Rowling, to the filming of the very last scene of the ever popular movies. They also said that a film set should not physically be able to last this long – they are just that – film sets, where they are built and pulled down again as each scene differs and film changes. I just hope they stay there for a few years yet to come, as I would dearly love for my own girls to grow up with Harry and immerse themselves in his enchanting and magical wizarding world. To be engrossed in the battle of good conquering evil; to encounter the perfectly conceived mythical creatures; and to be captivated in a fictional world of pure enchantment. I admire its appeal to such a wide audience. That enthusiasts and dedicated followers span from the very young child, where their imagination takes them on a journey into a mythical realm; to much older generations, where the imagination takes you straight back to being a child again. A plaque on the wall with a quote from JK Rowling herself, truly says it all……. A fabulous day out for all. Now I’m off the watch the box set all over again! Which is your favorite film or character? When filing into the very first room – keep to the left side if you can – this is because when you then enter the film room you will then be ushered through to be seated in the front rows of the auditorium. This will be beneficial to you on entering the next stage!! 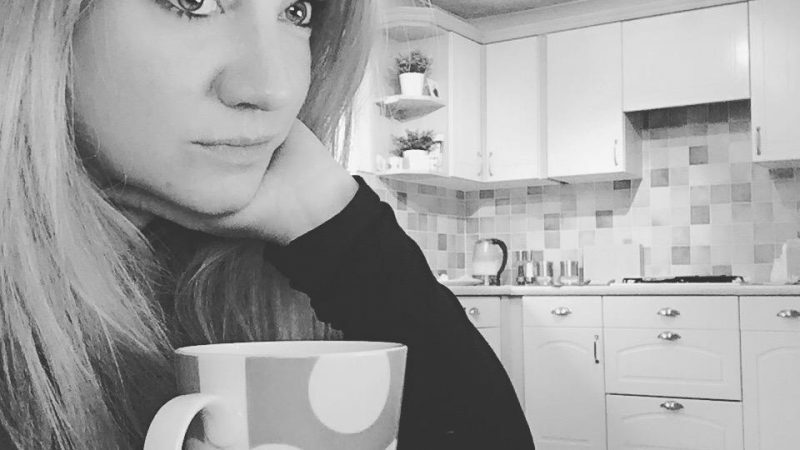 Trust me (without wanting to give too much away!) Especially if you have kids – or are a little on the shorter side like me! PS: Have your camera at the ready as you really will get the best shots! Make sure you visit the main desk in the tour lobby to collect your complimentary ‘Activity Passport’ – especially again if you have children. This includes a Golden Snitch treasure hunt along the route and stamps can be collected throughout at six stamping stations. Take photos by all means, but be sure to read the information boards too – as the secrets they divulge are pretty amazing! 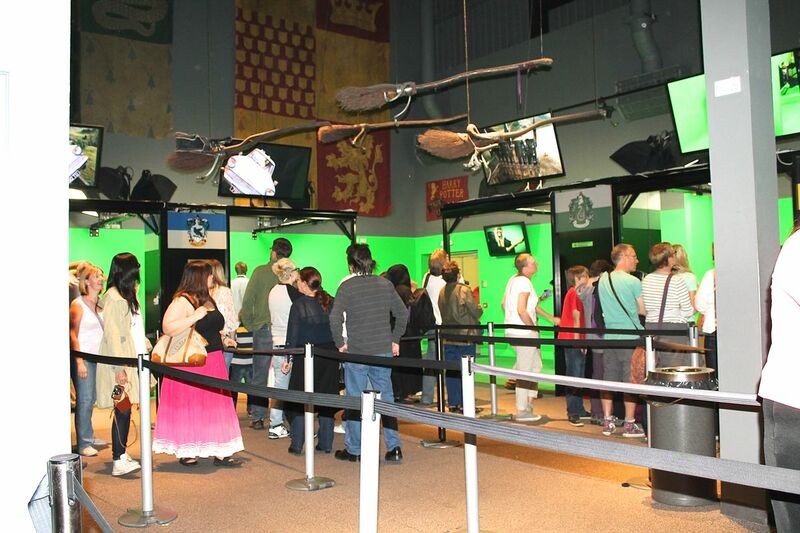 On entering the Sets & Special Effects room – and if you have children who wish to ride on the broomstick in the green room – I would suggest walking straight through to the other side and get first in line – this way you will not have to queue. Plus – you don’t miss anything as you just walk back to the beginning and take the tour at your own pace. Audio – we didn’t actually do the audio tour for a couple of main reasons – firstly, we were in a group and wanted to talk to one another freely with out the fuss of headphones and secondly, I did ask about it but was advised it was more for foreign visitors. This said though – in hindsight I would probably give it a go – as then I would be able to take pictures at the same time as hearing all about things. If you do choose the audio tour – this should be purchased at the front reception desk before filing through into the main queue if you didn’t include this as an extra in your original booking. If you truly are Potter fans, or have children who are in love with the books and films – you will more than likely purchase something from the gift store – be warned – it has everything they could possibly want (and more) and it’s fairly pricy. But still – its fab – and I wanted everything!!! Like it or loathe it – the butter beer is a must try. There is a cloakroom to use if you have come with all your winter woolies on yet don’t want to overheat en route! Plus buggies and pushchairs may be left here also. Complimentary Wi-Fi is available throughout – just in case you want to add your fabulous photos to your social media updates along the way!! day out, day trip, Harry Potter, hints and tips, Hogwarts, jk rowling, magic, special effects, Studio Tour, The Making of Harry Potter Studio Tour, Warner Bros. 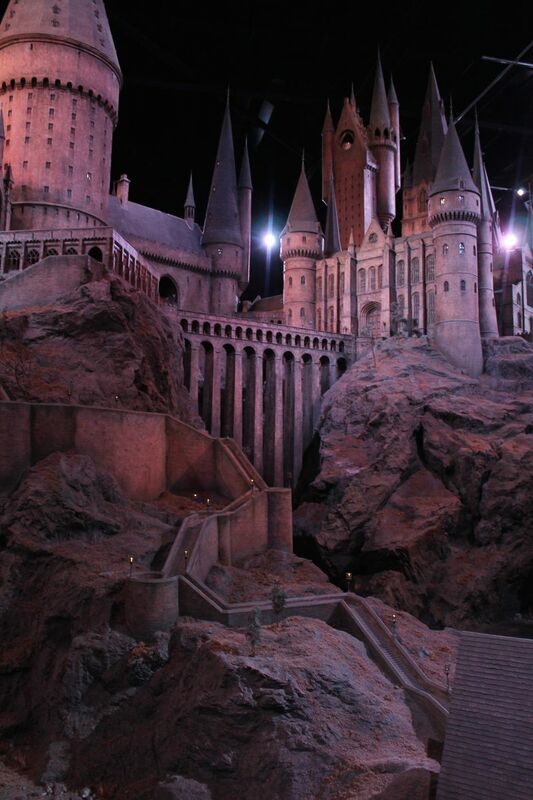 I would LOVE to go to the Harry Potter Studio’s it looks amazing! It sure looks like a great day out! This sounds like the stuff of dreams! We have been twice now and loved it even more the second time, it is such a wonderful experience we could go again and again and never get bored! My kids are huge HP fans, it’s like Harry Potter heaven! Wow that sounds fabulous, I always wanted to go there but now I’m even more certain! Maybe I’ll drop some hints to Santa 😉 Thanks for sharing. Wow is right. This is something very high on my to-do list. Every time somebody tells me about it, it seems even more amazing! 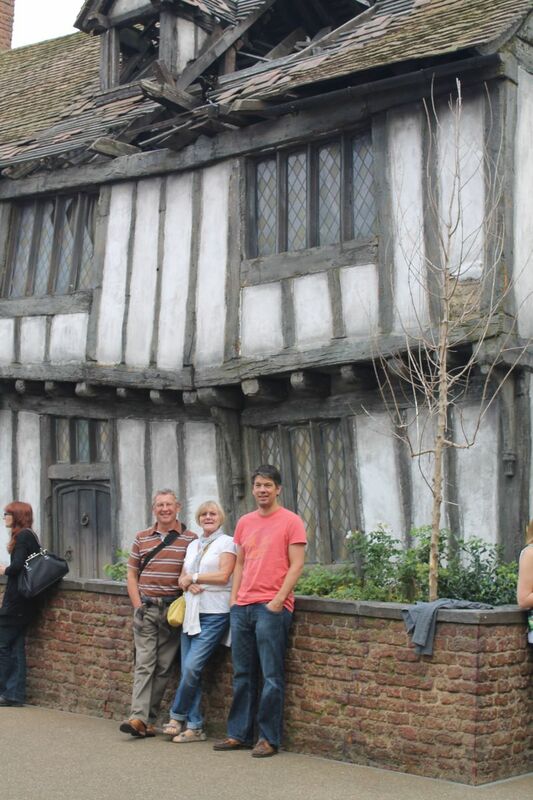 I have been lucky enough to have done the Harry Potter Tour in February, It’s amazing isn’t it! 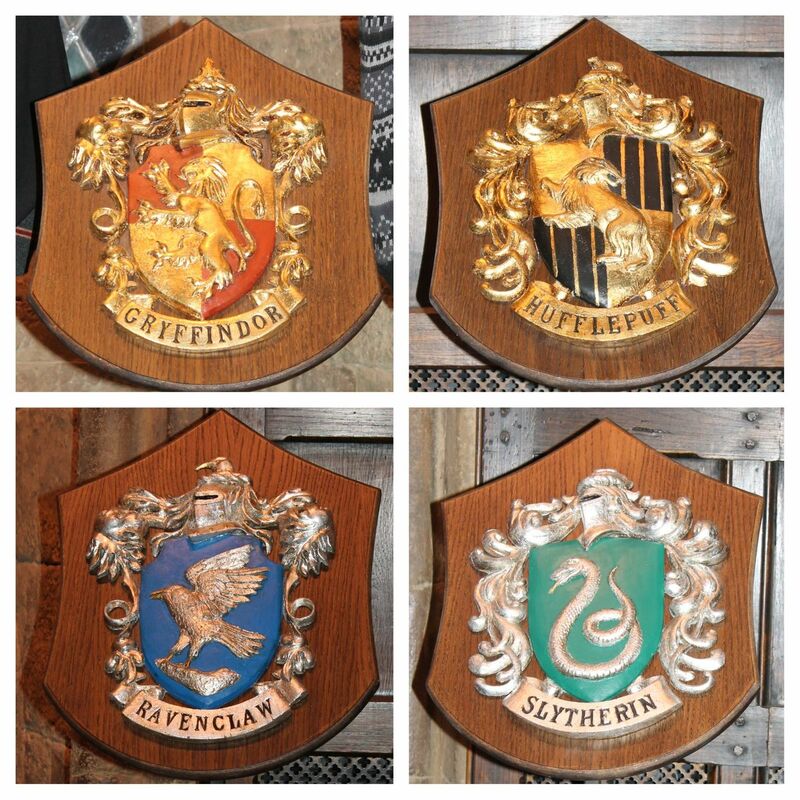 I am a huge Harry Potter fan – books are better then the films though!